NetVelocity's Chatbot: Comprehensible way to retain customers! Chatbot: A comprehensible way to retain your customers! Home/Chatbot/Chatbot: A comprehensible way to retain your customers! With NetVelocity’s Chatbot enable a dynamic communication channel for your customers, supporting informative conversations, and providing highly relevant, contextual and real-time responses. Artificial intelligence (AI) and Machine Learning are revolutionizing all varied tasks in every type of industries, from production lines in manufacturing to online retail to telecom. Not only is AI rapidly expanding to more and more parts of the business world, but it is also seeping in the common knowledge of consumers. By combining the latest Artificial Intelligence technologies and human understanding, Chatbots are able to provide superior customer care and support. 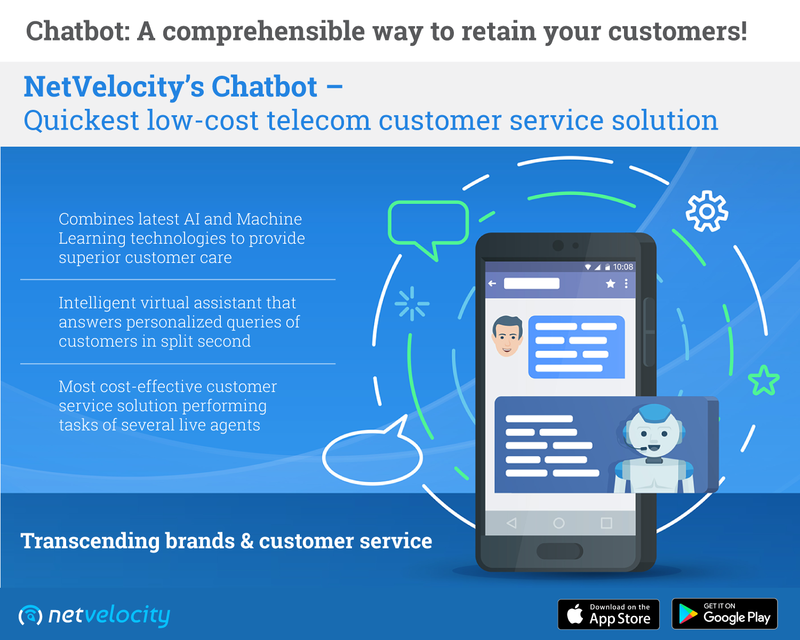 NetVelocity’s Chatbot is your low-cost telecom customer service solution. The intelligent virtual assistant allows customers to get answers to their personalized queries in split second, creating an effortless customer experience from start to finish. Chatbots communicate with us through text messages, and integrates into websites, applications or instant messengers and helps businesses to get closer to customers. Companies and brands can use it to improve their customer’s experience, to generate more sales and build a deeper rapport with customers. Online Chatbots save time and efforts by automating customer support. According to a Gartner forecast, by 2020, over 85% of customer interactions will be handled without a human using a self-service agent. Chatbots allow organizations to automate transactions at every stage of the customer journey and on every customer communication channel. Additionally, they assist in business tasks such as collecting information about users, helping to organize meetings and reducing overhead costs. Initiating a conversation to promote an offer or updating customers about latest offerings is completely hassle-free with Chatbots. According to a recent report by Grand View Research Inc., the global Chatbot market is expected to reach $1.25 billion by 2025 and grow at an annual rate of nearly 25%. It is a precise proof that the future of customer-facing business is closely connected with messaging applications, particularly Chatbots. Chatbots are the future of brand engagement and customer support. By simulating conversations with customers on the basis of their requirements, queries and historical data, NetVelocity’s Chatbot provides a quick and low-cost option to offer instant service to customers and make them feel like there’s always someone there to help. A single Chatbot can perform the task of several customer service agents and it is the most cost-effective customer service solution for brands running on low budgets and high customer interactions, enabled with Machine Learning and Artificial Intelligence. Getting information related to the telecom service provider’s call rates, tariffs, rentals, offers, plans, etc. via NetVelocity Chatbot is much easier, quicker and clearer. No more website searches, no telephone calls, no waiting on the line, getting answers to telecom queries had never been so simpler! Telecommunications Industry going the extra mile with these game-changing trends in 2019!